DENVER – It may seem funny to some that a lifeless collection of computers and cameras is worthy of a funeral. But when it came time to say goodbye to NASA's 12-year-old Stardust comet probe, scientists made sure the lights went out in style. NASA shut down the Stardust spacecraft late Thursday (March 24) to end a prolific mission that visited an asteroid in 2002, collected samples from one comet in 2004, and then recycled itself to visit another comet earlier this year. At about 7:30 p.m. EDT (2330 GMT), the mission planners commanded the four thrusters on Stardust to fire until the fuel ran dry – a final experiment to see what was left in the spacecraft's tanks after its 5.7 billion-mile (9.1 billion-kilometer) journey, and how it compared with estimates on the ground. To the side of the room, Stardust technicians had scrawled their personal estimates of how much fuel remained on a board for all to see. The real value was anybody’s guess, and the mood was palpable as many scientists prepared to say farewell to Stardust. "One way to look at this … from now to a few billion years, Stardust can be happy, healthy and fine without all those pesky commands coming up," Don Brownlee, principal investigator for the Stardust mission from the University of Washington. The spacecraft didn’t go down easy. The maneuver appeared to take longer to confirm than expected. As engineering data about Stardust’s condition reached computer screens, flight controllers presented a small rubber ball to Allan Cheuvront– Stardust program manager with the probe's builder Lockheed Martin Space Systems in Denver – in a tradition to relieve stress. Don Brownlee, space scientist and a principle investigator on the Stardust mission from Washington University, offered his congratulations to the spacecraft team for a mission well done. NASA's Stardust mission was a true comet success story. The $300 million spacecraft launched in 1999 to retrieve samples from the comet Wild 2 (pronounced "Vilt 2"). On the way, it swung by the asteroid Annefrank to snap close-up pictures. By 2004, Stardust caught up with comet Wild 2 and snatched up samples of the icy wanderer in a capsule that it dropped back on Earth in 2006. 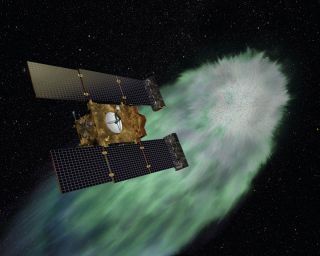 Then NASA gave Stardust new marching orders: go meet another object, the comet Tempel 1, which NASA's Deep Impact spacecraft visited in 2005 and hit with an impactor to see what it was made of. The new $29 million mission was called Stardust-NExT. R.I.P. Stardust: Commemorative cupcakes to mark the end of NASA's Stardust mission, which visited one asteroid and two comets during its 12-year mission. NASA shut down the mission opn March 24, 2011. As Stardust's systems flat-lined last night, Cheuvront conducted one final poll among his team members, asking for the final state of subsystems, such as power, attitude control, thermal and navigation. Each reported what their monitors last indicated as Stardust slipped away silently into the depths of space. "This kind of feels like the end of one of those old western movies where you watch the hero ride his horse towards the distant setting sun — and then the credits begin to roll," said Stardust-NExT project manager Tim Larson from NASA's Jet Propulsion Laboratory in Pasadena, Calif. "Only there's no setting sun in space." While the end of Stardust's mission had a sad note for some, NASA did have some treats prepared to lighten the mood. Cookies and cupcakes marked with R.I.P. were reportedly on hand during a "wake" following the end of the mission. Once the last poll was complete, the Stardust's finale had arrived. "At this time we say goodbye to a good friend. It is safe to say that Stardust is happy, healthy and fine," Cheuvront said. "All stations, we’re going off net now."